By the time I arrived at Strathclyde, I was prepared for anything. I’d taken care to pack plenty of woolly socks and I had all the emergency phone numbers written on the back of my watchstrap. But apparently I wasn’t prepared for the worst part; meeting my roommates – the bedbugs. Two days after I moved into Murray Hall my face, neck and arms were covered in huge, red, burning bites. I never guessed what it might be and focused on trying to get rid of the swollen mess that spread over my body. But nothing worked. Fly spray, repellent, and creams were all useless. No matter what I did, every day when I woke up I had new bites. Even if I could heal the old bites, I could never keep up. I didn’t know what to do or what was causing this. Two weeks later, my feet were so swollen it hurt to walk. I had an allergic reaction that meant that I looked like I had the plague. My face made people cross the road to avoid me and I couldn’t cover it up with make-up because it was so irritated. I felt, tired, ill and demoralised. Finally, I saw an insect in my room. Immediately I complained to the Village Office telling them my room was infested. The next day, Rentokil called round and I was allowed to move into a new room. By then I had managed to trap one of the bugs on a piece of sellotape to show them. I then had to wash ALL my clothes at 60°C or have them dry cleaned, and freeze everything else. It took ages. It was awful. I felt humiliated, angry and disgusted. Since I moved out, every floor of Murray Hall has had problems with bedbugs. And there have been infestations in other buildings including Birkbeck. But there have been no information sheets distributed, and no advice on how to spot a bedbug or what to do if they bite you. There’s no point in me attacking anyone; I’m writing this simply to make sure that everyone is AWARE of bed bugs. I don’t want others to have to experience what I went through. Rentokil are doing their best. My room has been stripped of everything including the carpet and the desk in order to kill every bug before redecorating. But I can’t help wondering why any of this happened in the first place. Why weren’t the rooms checked for bugs before we moved in? If I had known about bedbugs and how to check for them when I arrived, I could have done something from the start. 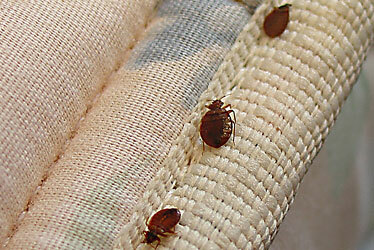 – Bedbugs can arrive on the clothes or belongings of someone who has only spent an hour in an infested room. They are transported by people; if you have bedbugs, try not to spread them, that’s how you ended up with them in the first place! – If a crack is large enough to take the edge of a sheet of paper, it could contain a bedbug. They can get into electrical sockets, carpets, televisions… Bedbugs can spread through a building from one flat to another through the wiring or plumbing conducts. – Bedbugs can live for up to a year without biting anyone. – Research in Vancouver has found that bedbugs can carry drug resistant MRSA. – Domestic products such as fly spray and flea powder don’t kill bedbugs. HOW TO CHECK FOR BEDBUGS? – Before you unpack in any hotel, hostel, new flat, or university accommodation, take all bedding off the mattress and wait to see if anything crawls out. (A bedbug looks like an apple pip.) If it does, trap it on a piece of sellotape as proof. Search for small brown spots on bedding, carpets, furniture or fittings. Look for small white eggs stuck to the seams of mattresses and bedding, and dry insect skins (they shed them like snakes) at the intersection between the carpet and the walls. WHAT TO DO IF YOU FIND BEDBUGS? – If you wake up with bites, or find signs of bedbugs, complain loudly and insist on moving immediately. – Wash all clothes at 60° minimum, dry clean or freeze everything else including shoes, books, wallets, etc. – Items like laptops that cannot be sprayed, laundered, frozen or dry-cleaned should be isolated from your other belongings. – If you are extensively bitten, go to the chemist or doctor asap. Whilst I have been unfortunate with my experience in halls, you never know when you might come across these little terrors so it’s always beneficial to know what you are dealing with. Commit these tips and suggestions to memory and hopefully you’ll remember how to avoid being in a similar situation. Remember: Sleep tight and don’t let the bedbugs bite. Posted in Features and tagged action, bedbugs, Halls, university. Bookmark the permalink.